You are here: Home>Archive>Days of Pride Collection.>Collection of items relating to Arthur Lewis Lloyd.>Slide of World War One memorial plaque. 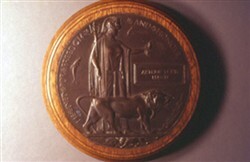 Slide of World War One memorial plaque. Colour slide of World War One memorial plaque in memory of ‘ARTHUR LEWIS LLOYD’.